New Releases & Sell Outs! Memorial Day weekend we released our new Sauvignon Doux, a sweetened take on our old classic. 100% Sauvignon Blanc grapes, this white wine is smooth and soft with ever so subtle notes of grapefruit & honey. We ran a sample tasting before bottling during one of our book club meetings, and could tell from the group’s collective reactions that it was going to be popular… But we had no clue just HOW popular! This limited run has flown off our shelves in the last month- and we’re down to our last 4 cases! We’re also excited to share our new Sweet Riesling, a nice addition to the Dry & Semi-Sweet versions we already carry. And coming August 12th, our brand new Hennepin Cobalt, a deep, dark, sweet red! We know many of you tasted this earlier this Spring and have been anticipating it’s release! Our team has been working non-stop this past month, a job made easier with the addition of new cellar help. Joe joins us after working in wineries & vineyards in Willamette Valley, the Finger Lakes & Napa Valley, and is responsible for keeping up with all the day-to-day operations that seldom get the glory of wine making, but have to get done for the process to continue! Having new hands on deck to move, drain, sanitize & prep the barrels, bottling line, and other winemaking equipment allows Kevin & Don more time during the crucial growing season to actually be out in the vineyard, directing their focus on turning those precious grapes into liquid magic! With so much happening, there’s never been a better time to stop out for a tasting or tour! Play the Niagara Wine Trail Game all summer long! – Post your pictures from any of the categories from the Niagara Wine Trail website on Facebook OR Instagram. – Using the hashtag gives you credit for an entry: 1 picture = 1 entry. The more pictures you enter, the more chances to win. Event Season Pass ($250 value each) Includes tickets to all the 2018 NWT Events. Random drawing from all entries to be done after Labor Day. All photos will become the property of the Niagara Wine Trail for promotional purposes. Pursuant to NYS Law, the minimum age to imbibe alcohol is 21. Please drink responsibly. Make sure Instagram photos are available publicly so we can see them! Pictures that reflect inappropriate behavior will be removed from the page and the contestant disqualified. In his family memoir Piero Antinori reveals the passion, tradition, and love of craft that have driven twenty-six generations of vintners: from the first ancestor who signed up to the winemakers guild in the fourteenth century to Antinori’s own three daughters, poised to carry this most celebrated family of artisans into the future. But The Hills of Chianti is about much more than wines. At its heart the Antinori story is about “Tuscan-ness”: a connection to the land, an appreciation for good food and drink, and the quintessentially Italian love of hospitality that make this one of the world’s most inspiring and memorable destinations. You’re invited to join us July 23rd for our monthly book club meeting for discussion of The Hills of Chianti: The Story of a Tuscan Winemaking Family, in Seven Bottles. Our book club always meets on the 4th Sunday of each month at 6:00PM, to discuss great books over a bottle of wine! We recommend reading the book in advance to join in on the conversation. This is a free social gathering, all are welcome to attend – but guests must be 21+ to drink. RSVP on Facebook to Save the Date! Wine & Cheese Summertime Pairing! Looking for something to do this weekend?! Kick-start June sampling wine & cheese pairings along the Niagara Wine Trail, USA! Tickets are still available and include a tasting of 3 wines & a cheese sample at 10 participating wineries of your choice! 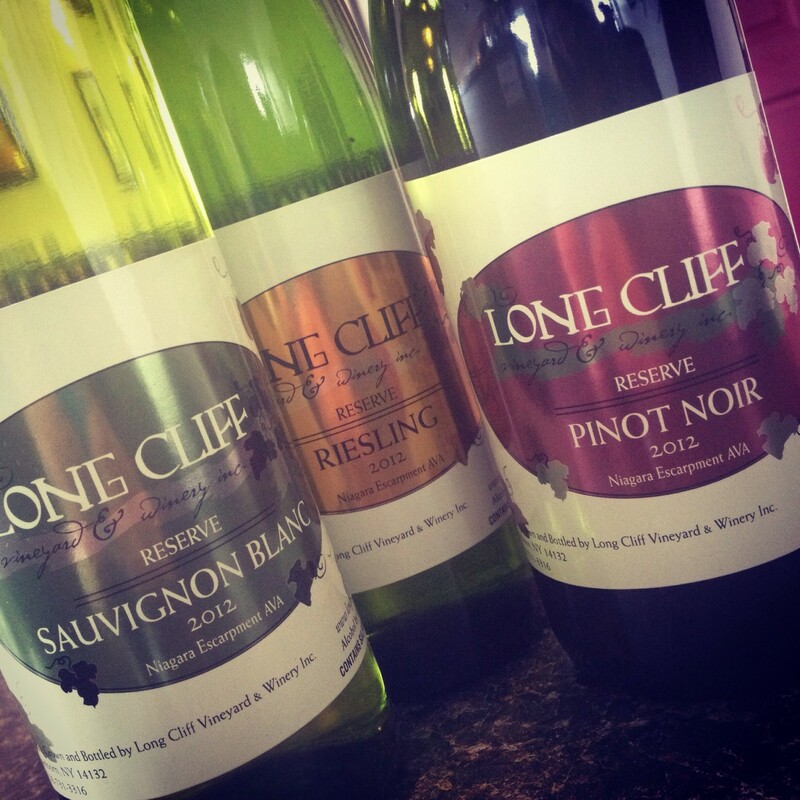 Long Cliff is excited to showcase our Autumn Select dessert wine (newly returning to our shelves after a brief sell-out last Fall), paired with Yancey’s Fancy New York’s Artisan Cheese Strawberry Chardonnay Cheddar! See for yourself why this light pairing makes the perfect treat for after supper, out on the patio on a warm night! You’ll definitely want to share this one with your guests all summer long! Curious what else is happening at the winery this Summer? –July 29 & 30: Niagara USA Wine Festival! We’re currently organizing a relaxed Evening with the Winemakers – join us to learn a little bit more about what we have planned for the future of our vineyard & winery, ask any questions you’ve ever had about wine making (or wine tasting! ), and socialize with our team & some of our best customers! Sound like an event for you? Please take just a moment of your time to answer this 3 question survey to help us with scheduling! 5th Annual Old Fashioned Corn Roast! Join us August 12th for our 5th Annual Old Fashioned Corn Roast! Part barbecue, part bonfire, part harvest festival – celebrate the season with dinner and wine tasting under the stars! All Pre-Sale tickets are available for $20 / person now through 8/6/17 – or until we sell out! At this time, we can not guarantee at-the-door ticket sales! Get the date on your calendar, and click here to purchase tickets now! Prices above do not include online ticketing fees & tax. To save on ticketing fees, please stop in the tasting room to purchase your tickets! Must be 21+ to attend. All ticket sales final. Fresh, charming, and wholly irresistible, Champagne Baby turns a familiar tale on its head: Instead of yet another American seeking the French secret to good living, a Frenchwoman finds her purpose – much to her surprise- in America… Part coming-of-age memoir, part travelogue: sprinkled throughout with regional maps and wine recommendations. There’s still time to read our May Book Club pick, Champage Baby by Laure Dugas before our next meeting Sunday, May 28th! As always, our meetings are free to the public (must be 21+ with valid ID to sample wine)- and while we recommend you finish the book before then, it’s never required! In search of Part-Time Associates! We are looking for motivated, out-going and passionate individuals who like to talk with and meet new people, share interests and recommendations about our local tourism industry or hometown sports teams and LOVE to taste wine & compare wines side-by-side… but we are NOT hiring wine TASTERS! Position is part-time, but availability on Saturdays from 10am-6pm and Sundays from 12pm-6pm now through October is a MUST. -Ability to carry 30+ pounds required to stock inventory (wine and gift items). -Participate in scheduled staff meetings & training sessions. -Provide general knowledge of the Niagara Wine Trail area. -Experience with wine desirable**, but willingness to learn about wine is essential! Bring May flowers! Join us for our next Trivia Night, happening Thursday, May 11th at 6pm! This month’s theme: May Bouquets – and we’re not talking about the aroma on your glass of wine! One question in each round will highlight flowers, blossoms and plants! Brush up on your springtime horticulture facts! Challenge your friends for bragging rights – plus a voucher for Free Wine Tasting for up to 20 of your closest friends! The game is free to play – tastings during the game are just $5 per person. You’ll want to arrive early to register your team, questions start promptly at 6:15pm! RSVP on Facebook to save the date – and share the event with your friends! Need something to read over Spring Break? Pick up a copy of our April Book Club pick and join us for wine & conversation with new friends on Sunday, April 23rd at 6pm! Publisher’s Summary: In 1925, the legendary British explorer Percy Fawcett ventured into the Amazon jungle, in search of a fabled civilization. He never returned. Over the years countless people perished trying to find evidence of his party and the place he called “The Lost City of Z.” In this masterpiece of narrative nonfiction, journalist David Grann interweaves the spellbinding stories of Fawcett’s quest for “Z” and his own journey into the deadly jungle, as he unravels the greatest exploration mystery of the twentieth century. **Read the book with us before it hits the big screen – Coming to a Theater near you April 14th! Save the date for something sweet! April 29-30 we’re pairing our Alsatian-Style wines with French Macarons! You don’t want to miss out on this incredibly decadent treat! Tastings are $5 / person and include your choice of 3 wine & macaron pairings! Participants in the Niagara Wine Trail’s “Taste of the Trail” will be able to choose three complimentary tastes of wine and two macarons upon presentation of their event ticket. (A third macaron can be added to the tasting for $1 / person). In addition, you’ll be able to visit ten other wineries along the trail for more food and wine pairings! Please visit niagarawinetrail.org for the complete list, and to purchase advance tickets for just $25!